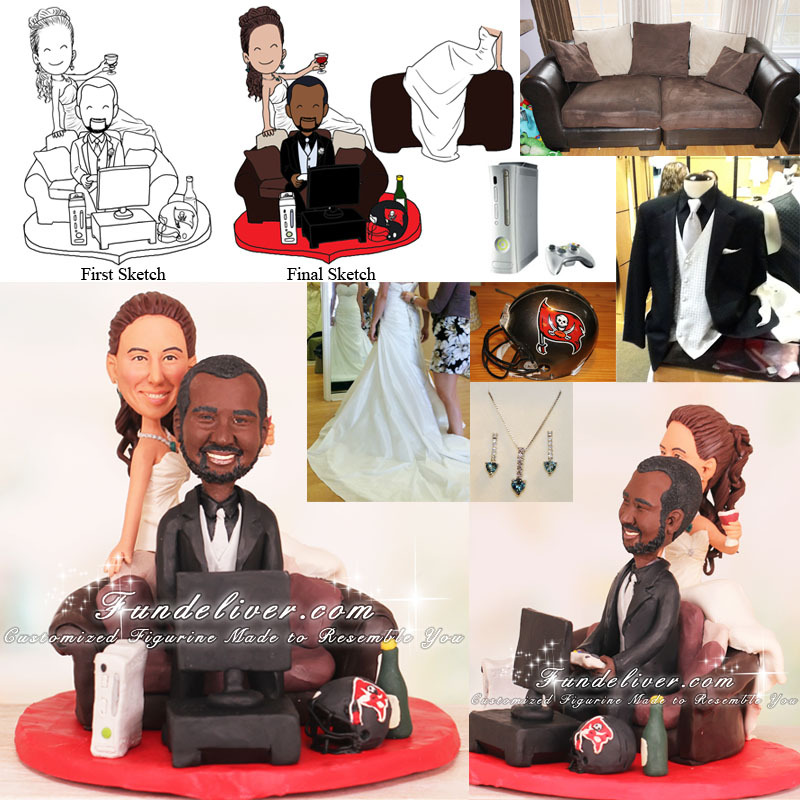 This is a completely customized bride sitting on couch while groom playing video game wedding cake topper ordered by one of our customers. The groom is an Xbox junkie and also a Tampa Bay Buccaneers fanatic. The bride is his best friend, largest supporter, and loudest cheerleader. They found inspiration for their topper from several of the ones we have previously done. So here is their design. 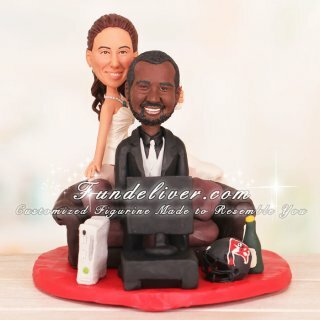 They would like the bride to be in her dress, sitting across the back of the couch in a manner similar to the Bride Sitting on Barbell Weightlifter Cake Topper, the right arm is placed on the couch. They would like her dress to fall mainly over the back of the couch. Instead of a flower bouquet in the brides' left hand, the bride would love to have an outstretched arm with a wine glass in it. She would like it to look like she is raising a toast or celebrating something. The groom is sitting on a brown sectional love seat with pillows, playing video games. He is in black tux, shoes and shirt, while the vest and tie are silver. He would prefer an open tux to show off the silver vest. He would also like to have his Tampa Bay Buccaneers helmet, a bottle of red wine and Xbox placed on the floor.